The CE approved B-Air Flex portable dryer is really a unique piece of equipment used by different organizations all over the world for things like water restoration, blowing up children's inflatable fun houses, and for inflating ornamental advertising structures. Many of the top rated flood, water and fire restoration companies absolutely love this blower because it can circulate air into hard to reach areas like closets, under counters, into cabinets, and in false ceilings. Basically anywhere one of our whistle style carpet dryers can't fit. This compact, lightweight, powerful air blower can also be used to help dry fabrics, and just in general circulate stale air that may be found in a basement or attic. The 11 pound blower is extremely portable and stands up to large amounts of use, without ever having to worry about it breaking down. That's why the restoration specialists love it, because it is lightweight, compact, powerful, and durable! 1/4 horsepower blower only pulls 2.6 amps allowing multiple units to be run off of the same circuit. 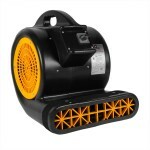 CE approval makes it the perfect blower for flood restoration and water damage jobs. Great for drying hard to reach areas like cabinets and false ceilings. Rotationally molded polyethylene housing make it extremely durable. Rubber feet help to keep the blower in place and prevent it from scratching any floor surface. Can be positioned in 3 different directions to maximize its drying capabilities. This is a review for the B-Air® 1/4 HP Flood Restoration Air Blower Dryer.